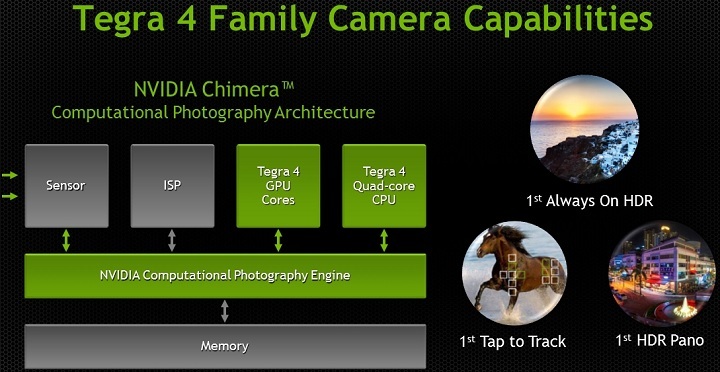 NVIDIA today unveiled new GPU Chimera dedicated devices and mobile platforms (smartphones, tablets etc). According to the press release, Chimera is the first processor that will be dedicated for camera mobile beginning with this spring and provides information from the sensor processing in a manner similar to the image processor DSLR cameras. Moreover, Chimera boasts HDR mode “always on”, which promises obtain images with a wider dynamic range and a new way of shooting panoramas, which allows obtaining large panorama by moving the device in any direction (and not just horizontally or vertically as it does so far). Tab-To-Track function allows tracking the subject in the frame and maintain focus even if it is moving. However, the main issue that stands out Chimera remains HDR mode. But what actually works Chimera? And what are the benefits? NVidia Chimera boasts primarily with performance HDR (High Dynamic Range) mode and “HDR always on”. What does this mean and what we do for you? It’s pretty simple: the market demand megapixels, in translation photo sensor that is as large resolutions. Meanwhile, mobile gadgets manufacturers can introduce their devices sensors in May with more general physical dimension that we must boast more compact gadgets (the thinnest smartphone, easiest tablet etc). The main problem is that the size of the large number of megapixel sensors is collide head. Current technology does not allow for a wider dynamic range if the physical dimensions of the pixels are too small and, thus, are not able to absorb enough light. Currently, the mobile camera sensors shows its limitations especially in situations where the differences are characterized by high contrast. The phenomenon of “sky burned” or lack of detail in the shadows, so post-processing HDR photos is a solution that allows obtaining images with a wider dynamic range even on phones. Another solution would be to reduce the resolution and number of pixels to equip sensor pixel sizes generous. Yes, the solution presented yesterday HTC HTC One (I looked this solution here). Comes with a sensor that provides only a resolution of 4 megapixels but only boasts a degree of light absorption of 3.3 times better than with current sensors. So pictures will have a better dynamic range, without the need for HDR processing.